The Harlan Cabin sets in a secluded area overlooking the Bitterroot River, with spectacular views of the Bitterroot Mountains. 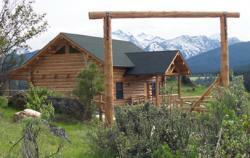 This completely furnished cabin was finished in August of 2001 and is ready for your enjoyment. Directions: The Harlan Cabin is located approximately 50 miles south of Missoula off of US Highway 93.